Dr Hazel has extensive experience in all aspects of transport and communications, both urban and rural. He has specific expertise from around the world in strategic planning and policy development, the integration of transport with other related areas, the future trends for mobility, smart mobility and innovative funding of transport infrastructure. He has studied transport policy and practice in many countries, both the successful and the unsuccessful, and has gained a detailed insight into the key issues and influences. He has worked in the public, private and academic sectors at a senior level and has acted as advisor to the Academy of Sustainable Communities, the Commission for Integrated Transport, Transport for London, the Queensland State Government, the Greater Toronto and Hamilton Region, the City of San Diego and many Government agencies around the UK. He has published a book on Making Cities Work and has presented at a large number of conferences around the world. 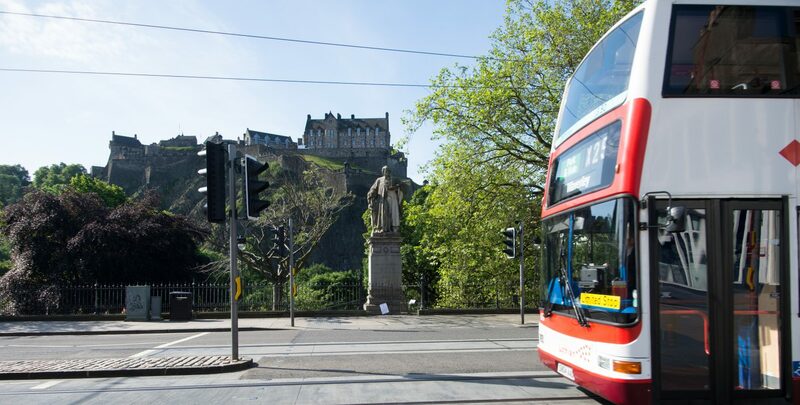 He is currently acting as Smart Mobility Network Integrator for Scottish Enterprise on the development of a smart mobility industry cluster within a national Open Innovation Partner Network. Steve has a PhD in travel behaviour and has worked with citizens and other stakeholders to design urban policy and technology solutions in the areas of smart cities, eGovernment and smart mobility. He has lived and worked in USA, France, Belgium and UK working in consultancy, academia and in a multinational IT company. Recently this work has included the development of future mobility insights for a large multinational and smart “total” mobility strategies in Vancouver, Brisbane and Toronto. Steve is Director of the future mobility design company Viaqqio which forms part of ESP Group alongside Systex and Journeycall (www.the-espgroup.com). Steve now lives in Edinburgh with his two daughters. Since moving to Edinburgh he has sold his car and become car-free- learning much about “mobility as a service”– an experience he captures in a video blog www.carfreefamily.com. Steve is a Non-Executive Director on the Boards of Lothian Buses and Transport for Edinburgh. Professor Richard Allsop is Emeritus Professor of Transport Studies at UCL, having been Professor since 1976 and Director between then and 1997 of what is now the Centre for Transport Studies. After graduating with a first in Mathematics from Cambridge, he joined the Road Research Laboratory in the Statistics Section of its Traffic and Safety Division. Soon after the Research Group in Traffic Studies was formed at UCL by Professor Reuben Smeed, he became a Research Fellow there in 1967 and Lecturer in 1970. Under Smeed’s supervision he completed an influential PhD on mathematical optimisation in traffic signal control. From 1973 to 1976 he was the first Director of the Transport Operations Research Group at Newcastle University, where he is now a Visiting Professor. Since being appointed Smeed’s successor at UCL in 1976 he has contributed widely to research, training and advisory work on many aspects of transport. From 1981 to 1996 he chaired the International Advisory Committee of the International Symposia on Transportation and Traffic Theory Since the early 1980s he has been active in what is now the CIHT. After becoming Emeritus in 2005 he has continued his longstanding involvement in road safety research and policy, including being a Director of PACTS until 2015 and a special advisor since then. He is on the board of the ETSC, where he advises its European road safety benchmarking programme PIN, which he led for its first nine years from 2006. For more than ten years until 2015 he contributed strongly to academic aspects of development of the TPP qualification. He was awarded the DSc degree in 1995 and made an OBE in 1997 for services to traffic management and road safety, and is a Fellow of the Royal Academy of Engineering and an Honorary Professor at Politechnica Krakowska and Moscow Automobile and Roads State Technical University. He holds the Highways and Transportation Award for professional excellence, a Prince Michael International Road Safety Award, and a Lifetime Award for road safety research from the Transport Research Foundation. Keith Dickinson is a Higher Education Consultant and Academic Advisor with over thirty years’ experience in senior academic management, teaching and research. Between 1986 and 2002 he held a variety of posts at Edinburgh Napier University, including that of Assistant Principal. During this time he was instrumental in establishing Napier’s Transport Research Institute (TRI). Since retiring from Edinburgh Napier University in 2002 Keith has undertaken a variety of senior academic advisory and leadership roles in universities within the UK and overseas. Between 2003 – 2006 he travelled widely in China. He was Associate President of Liaoning University of Technology (LUT), Jinzhou, northeast China and contributed to the development, management and delivery of a University of Southampton / Beijing Jiaotong University MSc programme in Transportation Engineering and Planning. Between 2006 – 8 he held an interim post of Director of Research at University of East London where he was responsible for preparing UEL for what became a very successful RAE2008 submission. Later he undertook a review of Research and Knowledge Exchange for UEL and recommended actions to enhance activity at UEL. More recently, between 2010 – 2012, Keith was Pro Vice Chancellor and Dean of the Lord Ashcroft International Business School at Anglia Ruskin University, again on an interim basis. Following his restructuring of the Business School and as a result of his actions and leadership the Faculty was able to deliver their first financial surplus for several years and ARU was able to agree to a major investment in new academic and research staff. He later helped plan, established and lead the Institute for International Management Practice (IIMP) within the Business School of ARU. IIMP provides a focus for internationally recognised applied research that aims to make a genuine difference to business practice. Keith retains a broad research interest in road traffic management and control, road safety, appraisal of transport schemes and pedestrian issues, has served on numerous national bodies and was a UK RAE Panel Member with a particular responsibility for transport in 1996 and 2001. He still holds the title Emeritus Professor of Transportation at Napier University and has been a member of the TRI Board since 2003. Neil holds BSc and MEng degrees in civil engineering from Edinburgh and Glasgow Universities, respectively. With over 35 years’ industry experience he has worked in contracting (Balfour Beatty), local government (Lothian Region) and consultancy; the last 25 years being with Halcrow/CH2M and most recently, SYSTRA, where he now leads their Scottish operations as well as contributing to business development for rail and consultancy, across UK and Ireland. At Halcrow he carried out broad management responsibilities as regional director (Glasgow), then regional managing director (UK North) followed by a spell as MD for Continental Europe with a major focus on Ireland, Poland, Romania and France. On the technical front, Neil has specialised in transport planning, policy, strategy, traffic management and multi-disciplinary studies. He has experience in feasibility studies and appraisal of all modes including rail, road, busways, harbours and ferries, and has often acted as expert witness in public inquiries for developers and authorities. He was closely involved with seminal studies on rural roads in Scotland, (e.g. Fitting Roads). He has also carried out traffic forecasts for ferries, rail services and stations as well new (privately funded) roads and the Skye Bridge. Neil acted as expert witness for the Edinburgh Congestion Charging public inquiry, supporting the Council’s successful technical case. At various times Neil has chaired the local branches of CIHT and ICE transport studies group. He is a chartered engineer, Member of ICE, Fellow of CIHT and a member of the Institute of Directors. He has served on CIHT National Council and was deputy chair of the Procurement and Network Management Boards. He is currently Chair of the CIHT Scottish Policy Forum. Laurence is a Chartered Engineer with around 15 years’ experience in the transport sector. He holds an MEng in Civil and Environmental Engineering and completed the part-time MSc in Transport Planning and Engineering at Edinburgh Napier in 2005. Laurence worked for SIAS Transport Planners on a variety of projects including the traffic and economic assessment of the M74 Completion and of the M8 Baillieston to Newhouse scheme. He joined Transport Scotland on secondment in 2006 to assist with the Strategic Transport Projects Review and became a permanent employee in 2009, working on a wide variety of projects. He led on the delivery of all Scottish Ministers’ responsibilities for the 2014 Ryder Cup at Gleneagles. Transport consultant. Formerly Head of Transport Group at the Scottish Executive/Government, with 24 years’ experience in the Senior Civil Service. Since 2005, Non-Councillor Member of the South East Scotland Transport Partnership (SEStran). Senior Independent Director, latterly Deputy Chair, Lothian Buses Ltd, 2010-15. Decision maker on (English) concessionary bus fares appeals, Department for Transport, 2006-10. Public member, Network Rail, 2008-10. Alex gained BSc and MSc in Civil Engineering from Glasgow University; he is a graduate of INSEAD Executive Development Programme, a chartered civil engineer and is currently the Partnership Director of SEStran. Alex is also a Director of two limited companies, One-Ticket Ltd. and BRT UK Ltd. He has held posts of Assistant Director of Roads and Transportation at Central Regional Council, Depute Director of Transportation at Lothian Regional Council, Head of Service at City of Edinburgh Council, as well as Director of tie Ltd and Associate Director of Oscar Faber TPA. He is past Chairman of the Institution of Civil Engineers East of Scotland at the Millennium and the Institution of Highways and Transportation C&SS Branch. He is a member of the Advisory Board of Edinburgh Napier University Transport Research Institute, he chairs the Scottish High Speed Rail Group and also represents Scotland on the Executive of the East Coast Mainline Authorities Consortium. An aeronautical engineer by training, Dr Mitchell worked at the Royal Aircraft Establishment Farnborough. He then joined Road Research Laboratory/Transport and Road Research Laboratory/Transport Research Laboratory from 1970 to 1994, working on public transport, transport planning and the social effects of transport policies, including the effects of the T&W Metro and of rail improvements in Glasgow. From 1982 he was Head of the Environment Divison. From the early 1980s he also ran TRRL’s research on transport for disabled people and led the group that drafted the first DPTAC specification for local buses in 1988. He co-chaired the US TRB Committee on Accessible Transportation and Mobility 2003-09 and is an Emeritus Member of TRB. He is a member of the CIHT Sustainable Transport Panel, edited the guidelines ‘Planning for Public Transport in Developments’, was author of the guidelines ‘Moving Freight’ and lead author of ‘Planning for Walking’. He provided the statistics database for IAM ‘Motoring Facts’. In 2009-10 he assisted UNDP with a study to improve the accessibility of public transport in Penang State, Malaysia and in 2010 produced a review of research on older drivers for the RAC Foundation. In 2012 he wrote ‘Speed and Safety’ for the RAC Foundation and PACTS, and in 2014 (with Allsop) ‘Projections of Road Casualties in Great Britain to 2030’ for PACTS. In 2015 he is a member of the Road Safety Foundation’s Older Driver Task Force, for which he leads the Working Group that provides evidence to support the work of the Task Force. Neil Paulley FCIHT is a Visiting Professor at the University of Surrey and Director of the TRL Academy until his retirement in 2014. As Director of the Academy Neil had responsibility for science and engineering activities and their strategic development at TRL, for formulating and ensuring delivery of longer-term research programmes and for ensuring technical quality across the company. He has 44 years’ experience in transport planning, leading many projects and programmes for a range of clients. He has worked extensively in the area of transport policy and demand forecasting, having a particular interest in the underlying causes of observed travel patterns, in the relationships between land use and transport and in network resilience. He has been Principal Investigator for several research projects for the UK Engineering and Physical Sciences Research Council. He is responsible for numerous publications, has sat on several advisory boards and committees and is on the editorial boards of Transport Policy and of the Transactions on Transportation Sciences. He is a member of US Transportation Research Board (TRB) committees and has been a Director of the Association for European Transport and Vice-President of the European Conference of Transport Research Institutes (ECTRI). Martin Richards, a Chartered Engineer and Chartered Town Planner with degrees from UCL and Birmingham University, has a lifetime of experience in transport planning and policy around the world. He led consultancy MVA (now Systra) from 1978 until his retirement, as Executive Chairman, in 2000. Since retiring he has been deeply involved in education, professional development and qualifications for transport planners, chairing the Universities’ Transport Partnership’s Employers’ Forum for 11 years, leading the development and operation of the Transport Planning Society’s Professional Development Scheme and playing a key role in the development and management of the Transport Planning Professional qualification. He was an Editor of the Springer academic journal Transportation from its founding and its Editor in Chief for 35 volumes. With Moshe Ben-Akiva of MIT he wrote A Disaggregate Travel Demand Model published by Saxon House in 1975 and, building on his experience in congestion charging in London, he wrote Congestion Charging in London – the Policy and the Politics published by MacMillan Palgrave in 2005. He has served on a number of national and international boards and committees, and was a Transport Research Laboratory Visitor for two periods. He was appointed an OBE in 1993 for services to transport planning, was presented with a Lifetime Achievement Award at the 2008 Transport Practitioners Meeting, was appointed an Honorary TPP in 2011 and was awarded a Certificate of Appreciation by the Transportation Research Board in 2013.